UPDATE 2:10 p.m. -- The CHP has confirmed that traffic is open in both directions now. The crash damaged the railing on the bridge and CalTrans has been on the scene examining that. In total three people were transported by air ambulance to more distance hospitals and one person was taken by ground ambulance to the Ukiah Valley Medical Center. UPDATE 1:56 p.m. -- The CHP has announced that U.S. Route 101 is now open to one-way traffic. Apparently, some one way traffic control had been in place for about 20 minutes. No word on the condition of the various injured parties. UPDATE 1:10 p.m. -- The CHP is now estimating that the road will open around 2 p.m.
UPDATE 12:25 p.m. -- At 11:29 a.m. the CHP indicated that the road would be closed for at least another hour, and now an hour later it looks that the road remains closed and traffic is backing up more than two miles. It seems that there have been some efforts to use Old River Rd. as a detour but traffic remains pretty bad. At least two helicopters have landed to take patients with severe injuries to out of the area hospitals. The details are not entirely clear, but it might be the case that as many as four people were badly injured, with multiple being transferred by helicopter. We will update when we get more exact details. UPDATE 12:15 p.m. -- The 101 remains blocked in both directions at the Green Bridge just south of Hopland. One CalSTAR copter has landed and taken an injured person to Santa Rosa Memorial Hospital, and a REACH copter is approaching, apparently to take another victim. It is unclear if this means travel north and south is actually possible using Old River Rd. We will attempt to clarify. Readers on the scene have reported that cars are totally stopped and people have exited their cars and are milling about. UPDATE 11:45 a.m. -- The highway remains blocked, with the CHP and CalTrans working to set up one way detours. The accident appears to have happened far enough south that the detour onto Old River Rd. is also blocked, though that might not be definitively the case. At 11:44 a.m. a CalSTAR helicopter ambulance was attempting to land in the area to receive a patient. No specifics on the number of injuries or the severity. Tow trucks have been sent to the scene. 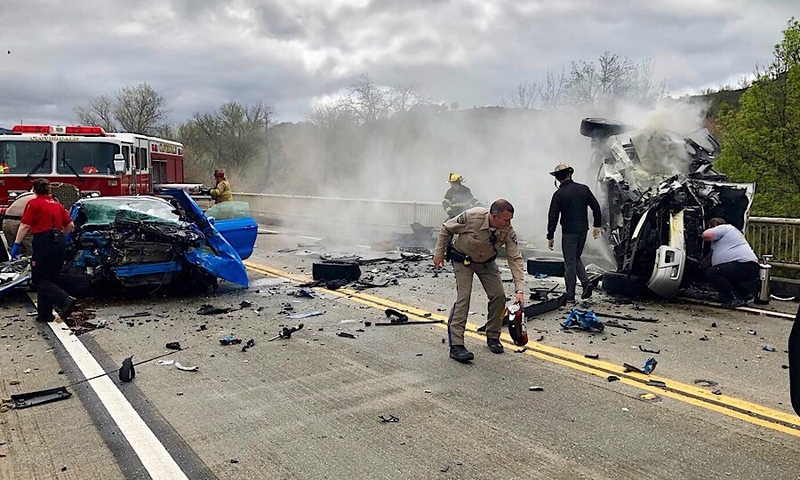 WILLITS, 4/3/19 -- A head on collision on the Green Bridge, on U.S. Route 101, just south of Hopland, closed the highway, and is continuing to cause a a major traffic back up as of 11:40 a.m. The accident was first reported at about 11 a.m. And early reports indicated that people were trapped in the cars. As of time of publication it appears, from scanner chatter, that ambulance helicopters had been sent to the scene and would soon be landing, indicating severe injuries. The highway will be blocked and closed to allow for the copters to land. Mainstream media announces: "Ok, you're right, it's all fake"